Lately I’ve been knitting in every second of my spare time. My mom has requested some knit headbands for a couple of her antique shows this holiday season to put antique buttons and pins on, so I’ve been hard at work with those. Also a couple of my co-workers have asked me to make a few custom items for them. I really love making those small things. Instant gratification and then often I get to see the knitwear in use which means me happy. I’ve got so many knitting plans and a sweater to finish and *cough* secret gifts to make *cough* so when I’m not working or studying it’s been full on knitting mode. 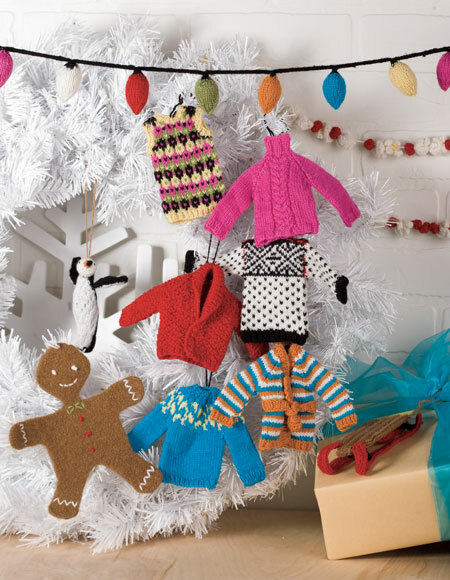 I was browsing the Knitpicks website and I think I’ll be making one or two of these tiny little sweaters for our tree this year.